If you are looking for that single, secret ingredient that has the ability to make just about any room look better, we have 5 of them right here! A splash of healthy greenery instantly lifts a space to make a room feel fresh and welcoming. On top of that, indoor plants are great for purifying the air, creating a healthier home. 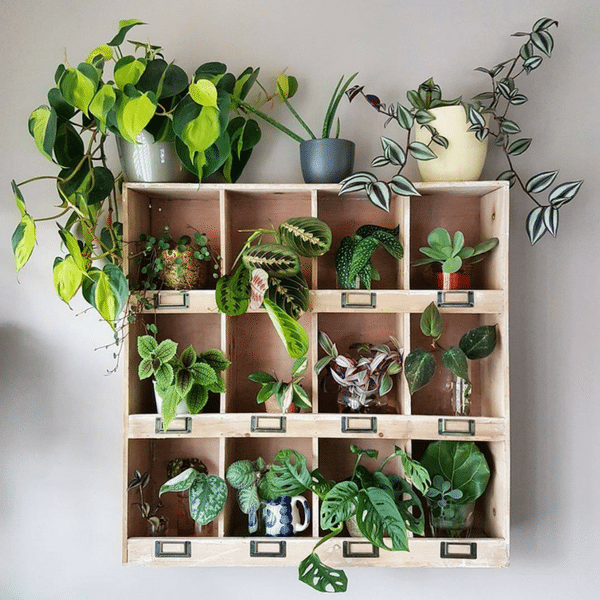 However, not all plants work well in indoor spaces, but with a little help from the beautiful Angela (@arapisarda) and her gorgeous plant inspired abode, we have put together this little list of the Top 5 Plants to Build Your Own Green Shelf! A very strong and low maintenance plant, especially when it comes to watering. These little ones love some bright light, just be sure to keep them out of the direct sun. They like a good quality all-purpose potting mix or if you prefer, trim off a few cuttings & arrange them nicely in some water as Angela has done below! A very strong plant that loves bright light (no direct sunlight), but do keep in mind these babies love to climb! Super easy to care for but they do love humidity, so in addition to watering about once a week, they also love a good spray of water once a week to keep the humidity levels up. A pot with no holes in the bottom is ideal to plant. The closer you can mimic the plant’s natural conditions the better—choose well-lit, warm and humid bathrooms or kitchens. This plant is one that can easily be compared with a succulent, it likes a sun – partial shade & doesn’t need that much water at all.The container Angela chose to use in the below picture is made from stone. An un-glazed stone container extracts water from the plant meaning you will have to water it more often because the soil dries faster. They also love a hanging planter or try more than one for a nice look on your table, or hanging over your window sill! From the same family as our first plant,Tradescantia spathacea variegata, these are very similar with their care and a very easy plant to look after. They adore the full sun or part shade and moist, fertile soil to keep them happy and healthy. Angela has chosen to pot hers in a nursery pot with drainage holes so when if it happens to get too much water, you can easily take out the pot and throw the excess water away. These babies thrive best in bright indirect light or partial shade that receives direct sun only around sunrise or sunset. It also isn’t a fan of having its soil wet for too long and is best to only water once the soil is almost dry. This is a fantastic houseplant, either in a pot as Angela has done below(add a post if you wish to see it climb)or spilling over the edges of a hanging basket. -Always check the soil, if it’s still wet don’t water it! Now you’re probably thinking: where can I get such miraculous plants that will survive my not so green thumb? Do they even really exist? Yes, they do. And you can easily pick them up from the majority of nurseries! Adding plants in your house is an affordable update that makes a big difference. Find a favorite plant and pot and get refreshing!